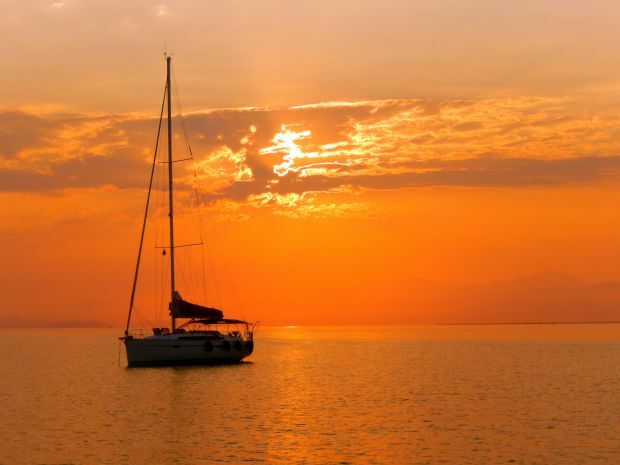 Our guest blogger and fellow sailor, Georgina Moon, is back with more helpful tips and recommendations for your next boat holiday in Greece. Having sailed in Greece many summers, Georgina is our go-to expert for all things Greek. From guiding us through Greek tavernas to dream island hopping itineraries, Georgina continues to share her passion and insider info for an unforgettable sailing trip in Greece. This month, we invite you to join Georgina in the west of Greece to discover the charming towns, beaches and coastal villages that you can visit at these suggested Ionian anchorages. When you charter a yacht from Lefkas, one of the pleasures is to spend a day at anchor. Swimming off the boat is a delight, as the water in Greece is so clear, and ideal for snorkelling. Even if you don’t fancy wearing a face mask, snorkel and fins, you can just float about in the beautiful turquoise water and admire the surrounding views, or swim ashore and sit on the beach. Alternatively, after a cooling swim, you could take the dinghy ashore and explore further. There are many places we have sailed to, during our Greek travels, that are worthy of a mention, for their crystal clear water and wonderful beaches. These are locations where it is easy and safe to anchor, and also possible to go ashore by swimming, or by dinghy. 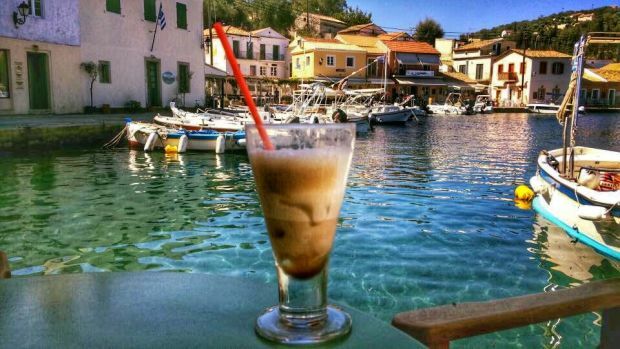 Enjoying a harbourside frappe, Loggos, Paxos. Photo by Georgina Moon. 10 miles south of Lefkas, where you will pick up your charter yacht, you will find the private island of Skorpios. Although the island no longer belongs to the Onassis family, Jackie’s beach on the south coast has been preserved. You are not allowed to land at most of the bays on the island, but yachts can anchor off this beach and you can swim ashore in this pretty bay. Lots of day trip boats also tend to call in here, so it can get busy. The water is crystal clear and it’s a great spot for snorkelling. Approximately 5 nautical miles NE of Skorpios is the lovely beach at Varko, on the Greek mainland. This is a safe place to anchor overnight. 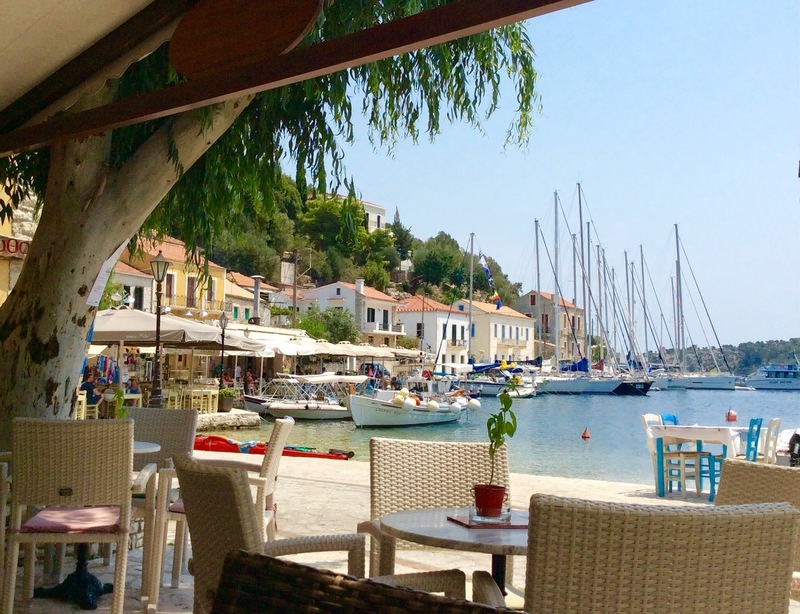 You can swim ashore and enjoy a drink at the beach cafe, or take a walk up to the Greek taverna a short walk away. If you are feeling adventurous, exercise your legs with a 3.5km walk along the road to the village of Pogonia. Also a short sail from Lefkas marina, Desimou beach is a lovely, peaceful anchorage less than 3 nautical miles from the busy town of Nidri. There are water sports here, and several small cafes and a taverna on the beach. You can take a walk up the hill and look at the lovely views over Vliho Bay. When you pick up your charter yacht from Lefkas, if you sail south for 10 nautical miles you will reach the small island of Meganissi. This ‘C’ shaped island has many bays and inlets on the north coast that are perfect for anchoring, so you might find one all to yourself. In a couple of the bays, you will find a taverna ashore, such as Minas taverna in Abelike Bay, or Niagas restaurant in Port Athene bay, where there is also a little shop. 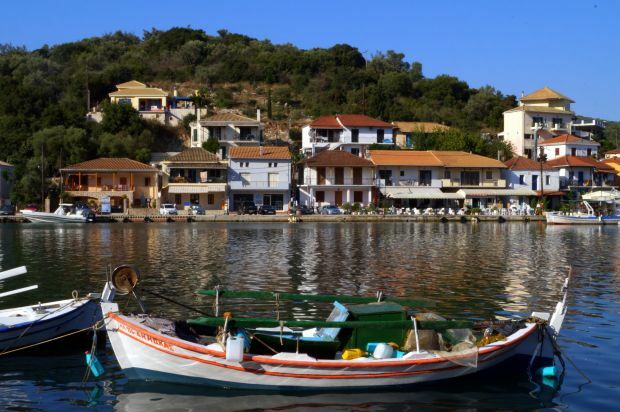 If you anchor in Elia Bay, after a short dinghy ride ashore you can join the little road up to the traditional hill village of Katomeri, where you will find a genuine Greek community where men gather at the kafenion, and old women still weave cloth on traditional looms. Many yachts head for the busy harbour at Kalamos town, on the eastern coast, approximately 20 nautical miles from Lefkas marina, where you can start your yacht charter. However, if you prefer to anchor, and swim off your boat, head for the south of the island and discover the big bay at Port Leone. Two ruined windmills can be seen on the southern tip of the bay, and opposite, a conspicuous yellow church nestles between the trees. There are no facilities ashore, but it is very peaceful and a lovely spot for lunchtime swim or an overnight stop. 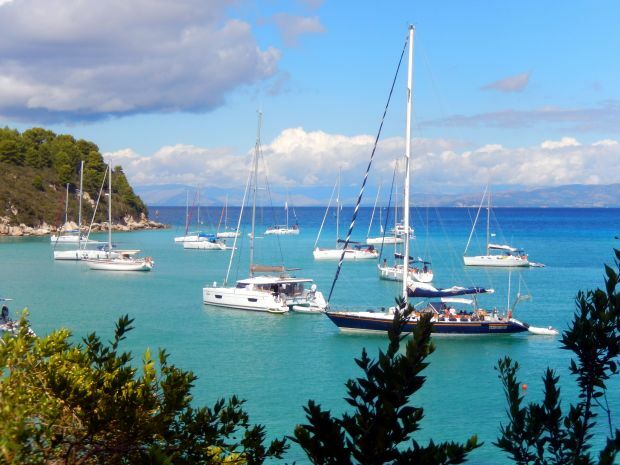 On the south-east coast of Corfu, you will find an anchorage at Notos, just south of Petriti harbour. There is a small beach here. Also, you will find two tavernas – the Panorama, and the Notos Garden. Both provide sunbeds and umbrellas and are located in beautiful lush green gardens with fabulous views over the sea. View from Panorama Taverna in Corfu. 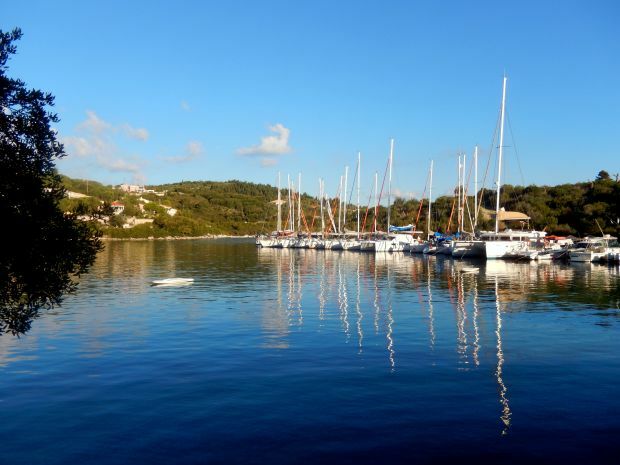 Further north, 7 nautical miles north of Corfu town, you will find the lovely bay of Kalami. On the southern side of the bay, you will see the White House, where members of the Durrell family once lived but is now a restaurant. The beach at Kalami is soft pebbles, with sunbeds and umbrellas. When you go ashore you will find several bars and tavernas, including John’s Place, which serves traditional Greek cuisine. 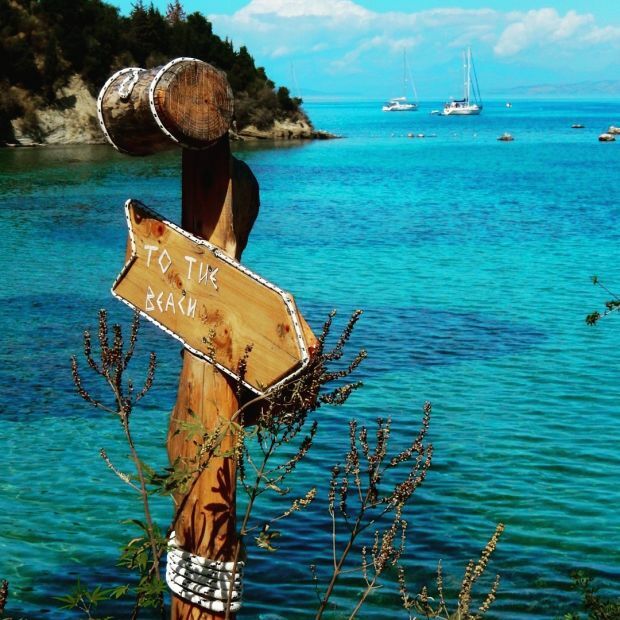 There are beaches close to the three main harbours at Gaios, Loggos and Lakka, but if you want to swim in some of the clearest waters in the Ionian, you should anchor in Lakka. As the seabed is sand, this makes the water a vibrant turquoise blue, which you really shouldn’t miss. A short dinghy ride will take you to the bars and tavernas on the waterfront where you can have a drink at Fanis Bar or the Romantica cafe. On the southern tip of Paxos is Mongonissi. The beach taverna offers free mooring on the quay (no water or electricity) and you can use their showers ashore. They also have a wonderful sandy beach where you can easily spend an afternoon with a cold drink relaxing on a sun lounger. This is also a good place to anchor and you can swim from the boat to the beach. 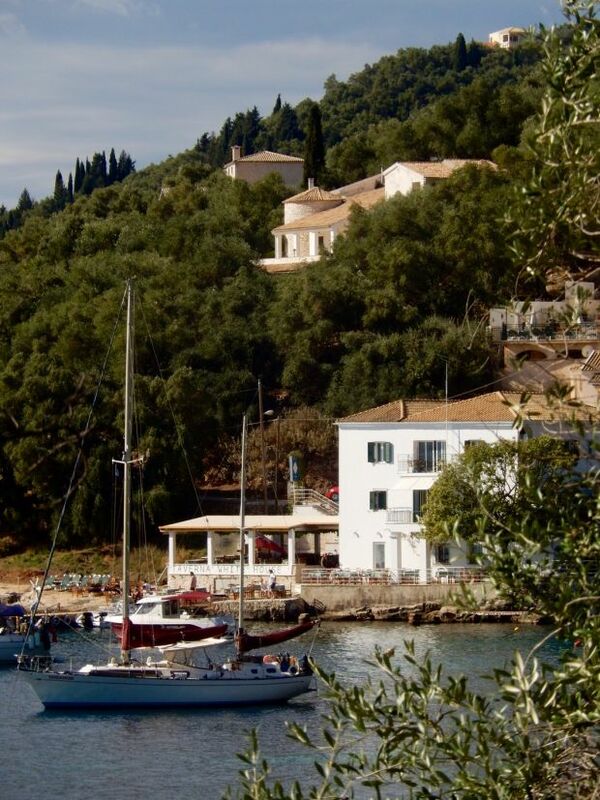 On the mainland opposite the southern tip of Corfu, and 20 nautical miles SE from Corfu town, are the Sivota Islands. There are numerous inlets and bays where you can anchor. Our favourite is called End Bay, which is approached from the south. A shallow sandbar divides the bay, but you can anchor to the east and take a line back to the rocks ashore. This is a lovely place for swimming and snorkelling. There is also a water sports centre here, run by a holiday company, so watch out for the windsurfers and canoes which buzz about the bay. You can take your dinghy a short distance over the sandbar and land on the little beach to the north. A short walk uphill will take you to the town of Sivota where the sunsets are some of the best in Greece. 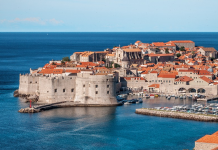 If you’re ready to discover these places on your own, contact us and we’ll help you find the perfect yacht charter in the Ionian Island region or search our fleet of boat rentals in Greece. 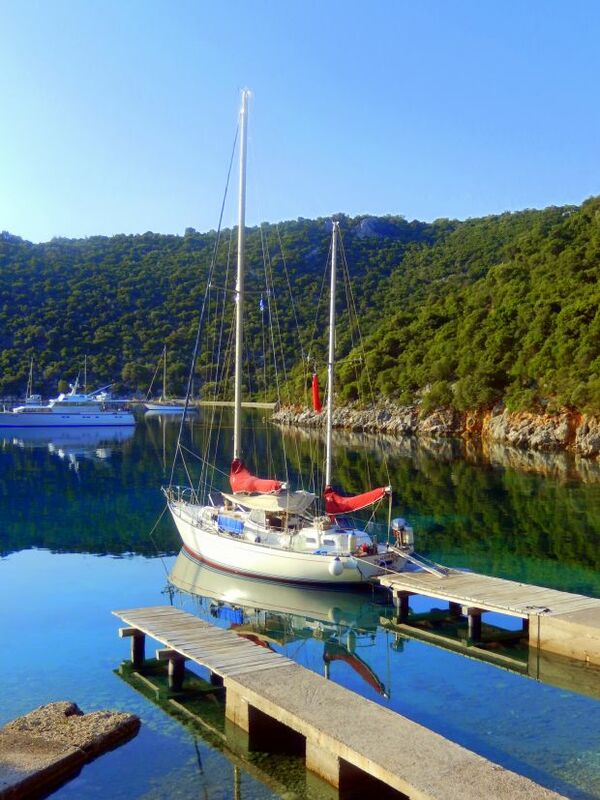 For more stories and tips about sailing in Greece and anchorages in the Ionian Sea, read more of Georgina’s posts on our Magazine or check out her blog.